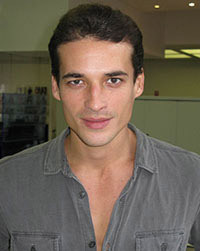 Jean Carlos Santos was born in Campina Grande, Brazil, in 1986 is a Brazilian male model. Jean began his modeling career in 2009, signed to modeling agency MC2 Model Management. L'Officiel Hellas, Made in Brazil, L'uomo Vogue, Zoo Magazine, L'Officiel Hommes Netherlands, CLIENT, V Man, Gente di Mare for Forbes Italy,Esquire Turkey, Homme Style, L'Officiel Hommes China Cover, Vanity Fair U.S., GQ Germany. Colonys, Moschino Disaronno Fragrance, Diesel Underwear, Rufskin, Macy's Brasil: A Magical Journey Campaign, Philipp Plein, Brunello Cucinelli, Vila Romana, Blanco, Dsquared2, Just Cavalli. Walked runway for Michael Bastian, Dsquared2, Vivienne Westwood, Giorgio Armani. Represented by agencies New York One Management, Paris New Madison, London Premier Model Management, Amsterdam Brooks Modeling Agency, Barcelona View Management. I was raised to not be afraid to take chances to learn new things, disciplined with schedules working and helping my dad in his shop since the age of eight.